It’s not a moss, it’s a lichen! Cladonia rangiferina and Cladonia portentosa are both known as reindeer moss or reindeer lichens. This lichen takes its specific epithet from the reindeer, Rangifer tarandus that consumes it during the winter months when other food is scarce. Although more cold hardy than where we store it in the herbaria, this specimen is now housed in the University Herbarium, University of California, Berkeley where it’s considerably more hospitable than its native habitat of northern boreal forests. Looking festive and tasty! 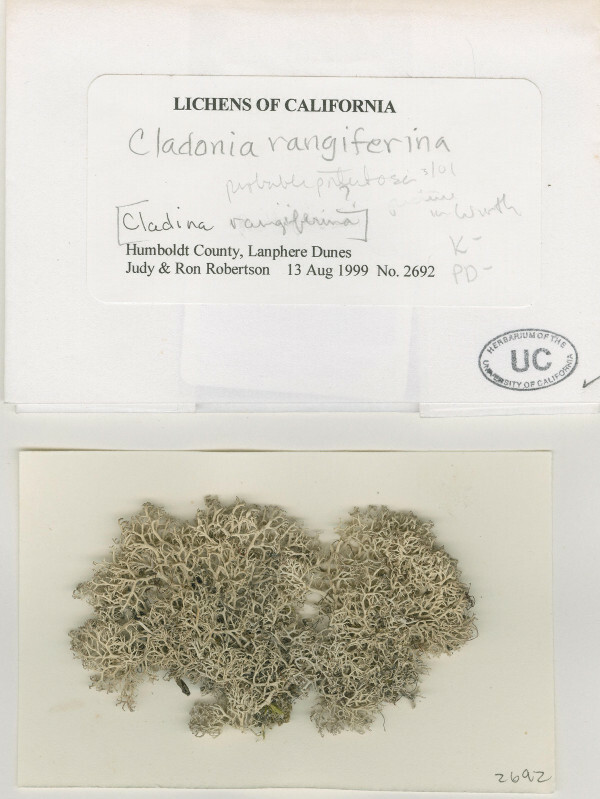 Cladonia rangiferina has been collected and vouchered in California only twice, in 1999 by Ronald and Judith Robertson, and in 1975 in Del Norte Co., in the Smith River canyon. 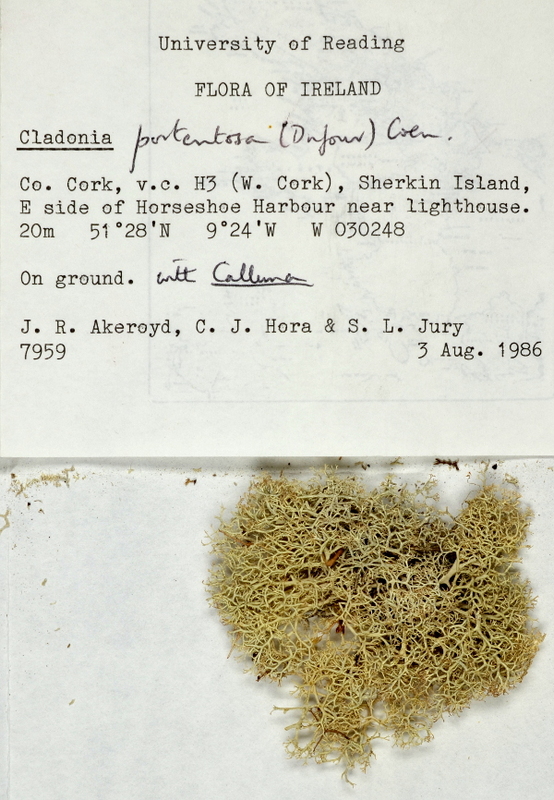 The Robertsons collected Cladonia rangiferina once in Humboldt County in the remnant forest of Lanphere Dunes, a US Fish & Wildlife Refuge. Using the database Symbiota, participants can clone duplicates, run optical character recognition software on typed labels and a myriad of other techniques to make data entry efficient. Editors notes: In the UK Cladonia rangiferina is uncommon but is at its commonest in Scotland where it occurs on many mountain heaths. It is also found on coastal sand dune systems and rocks in Wales and soemtimes elsewhere in the UK and is often found in the heaths of the south west tip of Cornwall. Far more common is Cladonia portentosa, which forms large masses in any open acid habitats, especially heaths and dunes and has a distribution that can truly be called widespread in the UK. 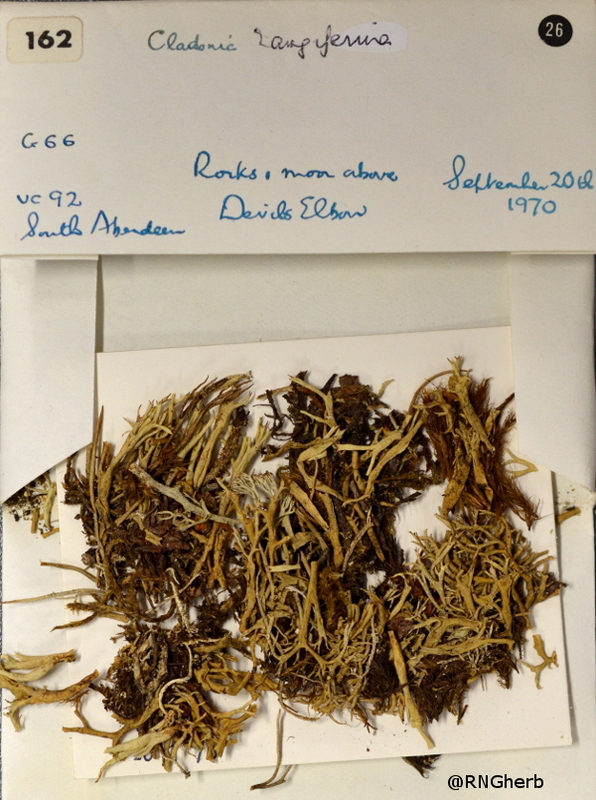 This entry was posted in Advent, Herbarium RNG, Public Engagement with Science and tagged Cladonia rangifera. Bookmark the permalink.